Looking southeast from the family/vip viewing platform at the WTC. 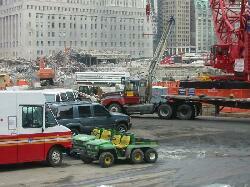 WTC tower 2 (south tower) once stood just beyond the green truck. 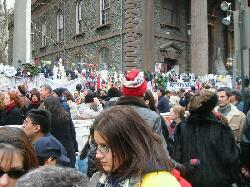 Looking east from the family/vip viewing platform at the WTC. 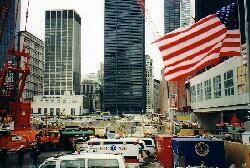 Looking northeast from the family/vip viewing platform at the WTC. The Marriott Hotel once stood just beyond the white horizontal pipes. 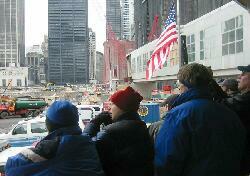 Looking northeast from the family/vip viewing platform at the WTC. 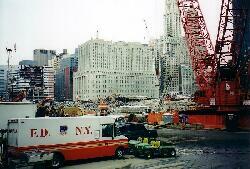 WTC tower 1 (north tower) once stood just beyond the construction equipment. 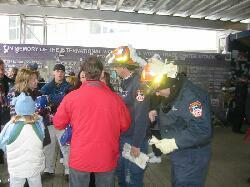 Two firefighters chatting with visitors. 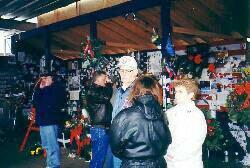 The visitor platform was lined with momentos to those lost at the WTC. 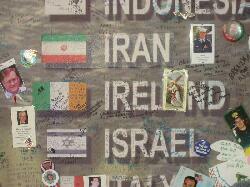 A portion of the board that lists all the countries that lost people at the WTC. Map of World Trade Center. 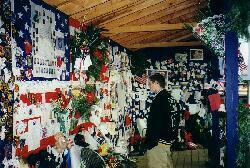 area for recovery workers at the WTC. 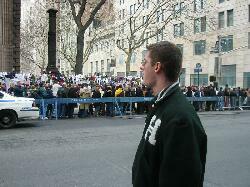 Captain Kearon's nephew views the memorials to WTC victims. 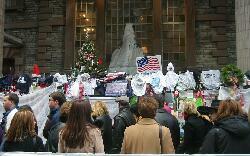 Many thousands of people were here hoping to gain access to the public viewing platform. 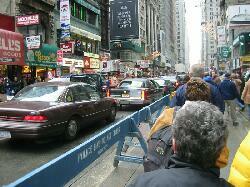 Ladder 15 among the traffic and crowds on Broadway.